This holiday season, are you looking for a Balsam Fir, Blue Spruce, Fraser Fir or other variety of Christmas tree? Do you want to buy a fresh cut one or head out with the family to cut down your own? No matter what you're looking for, the Lake George area Christmas tree farms listed below are a great place to start your search. Make Ellms' Christmas Trees a part of your family's holiday season traditions! This local Christmas tree farm lets you choose and cut your tree, take a trolley ride, enjoy hot cocoa, and more. It's a fun experience your family won't soon forget. Candy Cane Farm in Gansevoort is just a short drive from both Saratoga Springs and the Glens Falls Region. 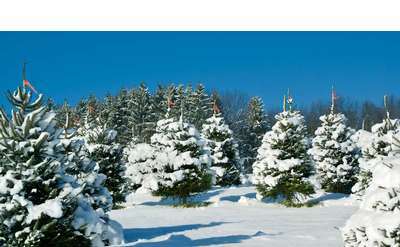 Cut your own tree in a variety of different types or choose from a beautiful collection of fresh, pre-cut trees. Mead's Nursery in Queensbury has beautiful pre-cut Christmas trees for you to choose from, as well as wreaths, kissing balls, other holiday greens, and even more decorative items. Place your order for custom items early! Sunnyside Gardens transforms into a winter wonderland each year! You'll find freshly cut Christmas trees, handmade wreaths, beautiful poinsettias, other holiday greens, and even indoor decorations. Brown's Tree Farm offers cut-your-own Fir and Spruce trees, as well as wreaths and kissing balls. Don't want to cut your own? The staff at Brown's will do it for you! Cut your own tree at Riverbend Tree Farm in Lake Luzerne. They offer Fraser Fir, Balsam Fir, Cannan Fir, Concolor Fir, and Scotch Pine. You'll also find beautiful holiday wreaths for sale. Make a new holiday tradition with the family by going to cut down your own tree at Bailey Family Christmas Trees! The farm opens for cutting on the day after Thanksgiving and features seven different species of trees reaching heights of up to 14 ft.
Visit Kelly's Emerald Feeds in Queensbury for a great selection of Christmas trees, wreaths, and other holiday greens.